^ "46 Die in Crash of Alitalia Plane In Mountainous Area Near Zurich." 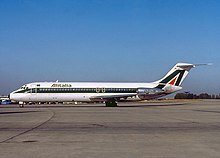 ^ http://www.airsafe.com/events/reports/alitalia-dc9-1990.pdf, Final Report of the Federal Aircraft Accidents Inquiry Board concerning Alitalia Flight 404, 1990. ^ Italian jet crashes near Zurich -- 46 aboard feared dead. UPI. [2017-04-30]. ^ 4.0 4.1 Ranter, Harro. ASN Aircraft accident McDonnell Douglas DC-9-32 I-ATJA Stadlerberg. [2017-01-18]. ^ I-ATJA Alitalia McDonnell Douglas DC-9-30 - cn 47641 / 746. Planespotters.net. ^ PILOT ERROR SUSPECTED IN ZURICH PLANE CRASH. Associated Press. [2017-04-30]. ^ 13.0 13.1 13.2 Swiss say plane flew too low, black box found. UPI. [2017-04-30]. ^ 14.0 14.1 Final Report Alitalia Flight 404 (PDF).